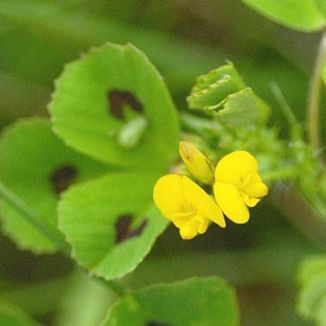 Spotted Medick is not easily confused with other wild plants on this web site. This is a prostrate annual plant of bare or grassy places. It has small heads of 1-6 yellow peaflowers, each little flower 5-7mm. It flowers from April to September. 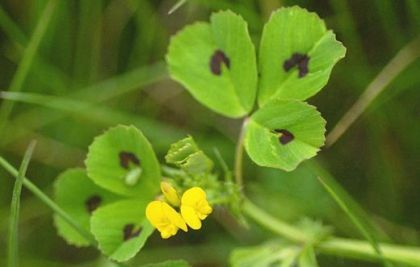 This plant differs from its more frequently found cousin, Black Medick, not only by its trefoil leaves having one dark spot in the centre of each heart-shaped leaflet, but also by its seed pods. These are twisted, spiny pods with little hooks on them to aid dispersal and out of these pods will emerge a single young root. This is an introduced plant which belongs to the family Fabaceae. I am very grateful to Roy Watson, of the Wexford Naturalists Field Club, for pointing out this plant on a walk at Kilmore Quay in Co Wexford in 2008.